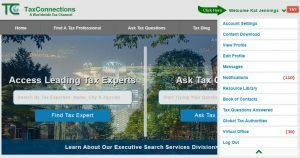 New Resource For TaxConnections Tax Professional Members - List Of Global Tax Authorities Contact Information | TaxConnections is a where to find leading tax experts and tax resources worldwide. TaxConnections Members have a new resource available to them when they Login. For those of you who may be unaware, our subscription members have tools and resources available to them that are unavailable to non-members. We want to remind our members they can now Login and access a new tool that lists the worldwide tax revenue authorities. We are continuously updating this list so come back often as we update this valuable resource for our members. This list contains the last known email address and contact information for tax revenue authorities worldwide. In order to find this list please look at your “Welcome Your Name” dropdown navigation bar. If your bar displays a short list or is locked it is because you are not a paid subscriber. If you cannot access your account, please contact us.